This spooky cookie is a combination of an oatmeal cookie, peanut butter cookie, chocolate chip cookie and a candy cookie all together. Of all the cookies out there this has to be one of my favorite because of all the flavors that are going on. I used to purchase these at my old job almost every lunch because they are just so delicious. With these cookies you can make the cookies out of leftover Halloween candy from Trick r' Treating. I've seen it with different kinds of stuff in them but traditionally they have oatmeal, peanut butter, chocolate chips and candy pieces like M&M's. All of the great stuff in them. I'll do a little confessing, I had to do these cookies twice. I tried to use a candy-coated chocolate candy that was Halloween colors and they didn't come out right so I made them again. Don't worry they won't go to waste. 1. In a large bowl, cream together butter, dark brown sugar and granulated sugar for 5 minutes. Add peanut butter, honey, salt, baking soda and baking powder. Let that mix for 2 minutes. 2. Add one egg to the butter-sugar mixture then one cup of flour. Add second egg to the mixture then the last cup of flour. 3. Turn your mixer on a low then add the oats one cup at a time. Fold in chips and M&M's. 4. Cover and place in refrigerator for 2 hours or overnight. 5. Preheat oven to 325. Line cookie sheets with parchment paper. Scoop 1 tablespoon worth of chilled cookie dough onto lined pans. Bake for 10 to 12 minutes rotating halfway through or until lightly golden brown. 6. Let cookie dough cool on pans for 5 minutes then transfer to a cooling rack letting them cool completely. Tip: Chilled cookie dough equals better cookie. These sound so good! I love all of the above cookies but especially oatmeal! Very cute decoration for Halloween! oh yum! These are like all my favorite cookies combined. 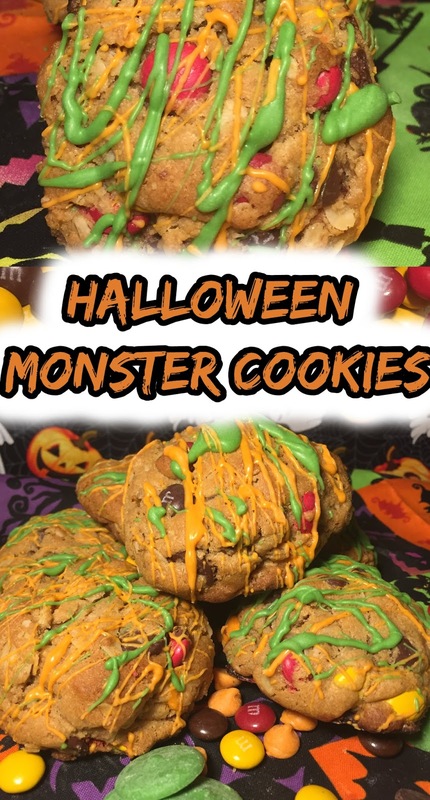 Monster cookies are such a great flavor combo, and no doubt the name is perfect for Halloween! Enjoy! These look so perfect for Halloween....I can't wait to dig in! Why why would you show off something so scrumptious? We've been craving sweets since our trip back from Japan. At first the oatmeal addition makes it look like a mess, but seriously all the chocolate yumminess makes you think screw aesthetics and get in my belly. We must add this to our foodie to-do list. These look super yummy and fun to make. My three favorite cookies all in one, it doesn't get much better than that! I will definitely be making a batch of these very soon! These look fun to make! and mmmmm, M&Ms! I love a good cookie with a lot goin' on. These look perfect! Can you adopt me so I can eat all the yummy stuff you bake. Looks amazing! Wow! These cookies are chocked full of all the good stuff. Dangerous stuff - I could imagine myself sitting down with two (or three) of these and a tall glass of milk. I'm sure the kids would love to eat these at the Halloween parties. Love the green slime all over the cookies. These are perfect for a Halloween party! I love how colorful they are too. Love how festive and delicious these look! I’m saving this for next year! Thank you!! How festive are these cookies! Super cute! Even though Halloween is over I think I still want to attempt to make these for my kids! A fun holiday activity to do with the kids and to use for a holiday party or for the kids classroom. These sound good! I'd be tempted to throw in some cinnamon too.. because why not have every good thing at once? looks scary but very delicious..these cookies are perfect for Party!! These look fabulous! My daughter saw the pictures over my shoulder and we now have an activity for this afternoon! The cookies look so good, I like the whole presentation including the color co-ordination you have done with the decoration and topping the cookies. This sounds like all of my favourite things rolled into one! I have to try them out! These are spooky, all right! I'm all about the combination of candies and different cookie types: I bet these are delicious! These look so delicious! Love the recipe and the instruction too, quite simple to follow! Still going to make them even after Halloween! LOL...you really did justice to these cookies...I am sold! Such a awesome idea!! making trick-or-treat leftover treats!!! You had me at cookie :) These look scrumptious, and you can even change out the drizzle and m&m colors to make them anytime of year! How perfect for Halloween. I bet these didn't last very long, everyone must have loved them! What a great way to use leftover Halloween candy! I'm saving this recipe for next year. This is one super creative idea! I am sure it is super fun to make with the kids! 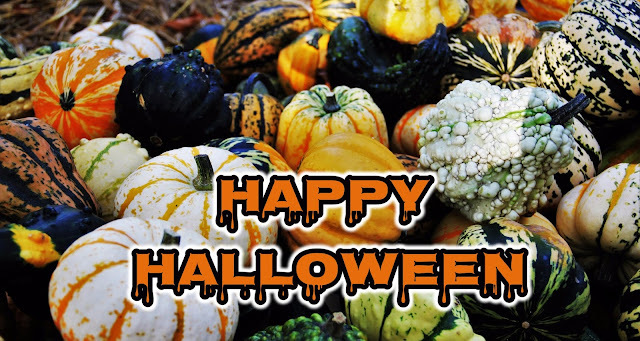 So bad Halloween is over now, such a fun time of the year!